Diaphragm pressure plates are for street performance cars and trucks. These will provide the substantially increased clamp pressure necessary for high torque muscle car or crate motor street machines operating in a lower RPM range. RAM diaphragm clutches are approved for heavy-duty street and limited competition. For full race vehicles, please select RAM Long Style clutches with heavy duty covers. Borg & Beck clutches are best suited for heavy muscle cars and are exact duplicates of the original Mopar & AMC pressure plates. 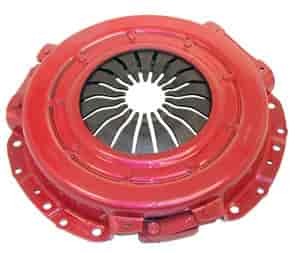 The 10.95'' version uses a larger 11-inch pressure ring for more surface area and heat dissipation, and bolts up to a 10-1/2 inch clutch pattern for smaller bellhousings. For full race vehicles, you will want to use RAM long style clutches with heavy duty covers. Diaphragm pressure plates are for street performance cars and trucks. These will provide the substantially increased clamp pressure necessary for high torque muscle car or crate motor street machines operating in a lower RPM range. RAM diaphragm clutches are approved for heavy-duty street and limited competition. For full race vehicles, you will want to use RAM long style clutches with heavy duty covers. The Long Style is the preferred pressure plate for true competition clutch systems. These units provide a combination of static and centrifugal pressure. This characteristic allows setting up the clutch to suit the car and track conditions. Static pressure is provided by coil springs and remains constant throughout the RPM range of the motor. Additional pressure is provided by centrifugal force acting on the levers which impart this force to the pressure ring of the clutch. Centrifugal pressure is RPM sensitive, meaning the force increases as the engine RPM increases. Long Style clutches are available with fixed static and centrifugal pressure or with adjustable pressures to allow precise clutch tuning. Long Style clutches feature explosion resistant pressure rings, chrome vanadium springs for long life without loss of pressure, welded spring guide cups in a heavy duty cover, and all new heavy duty hardware. RAM can build Long Style clutches in any pressure range and with or without counterweight levers for non-shifting applications such as Lenco or other clutchless transmissions.